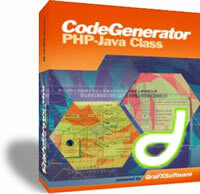 This package is meant is automate the generation of classes to access databases in Java beans style. It uses the Fast Template engine to process template files that define the skeleton of functions and variables of classes that store and retrieve data object property values from a given database table, getter and setter functions to access those properties and a function to delete a data object row from the respective database table. The package comes with templates to generate classes either in PHP or Java. The PHP template defines code to access data objects in a MySQL database. The Java template defines code to access data objects in any database supported by JDBC. It is extremely useful in case you have a Mysql table and you would like to generate a class over this table which would have a constructor, saving (updating) and drop option, and to provide the possibility to enter and query internal variables assigned for each field of the table. The advantage this generator provides is generating a class scheleton which may be altered in the future. The disadvantage consists in reduced applicability as it is useful in case the first field is set as Primary Key. Code generation is one way to increase software development productivity by automating the production of code components meant to execute repetitive well known tasks. Depending on the capabilies and maturity of the generator tool, the productivity increase may be huge. Database access classes is a common application of code generation tools. Tables are abstracted by database access classes and the table rows are mapped to objects of those classes. The approach of this code generation package is to use a well known template engine class, Fast Template, and make it process template files that define the skeleton of the database access classes to be generated. The example templates for generating database access classes either in PHP or Java demonstrate that with a simple approach it can be provided a flexible solution for addressing a common problem especially in Web application development. If you like our script, please rate it!